It has been a while since I went on a movie date with my sissies. Come to think of it, it has been eons since we went out. I am after all living far, far, away. Figures. Now I am missing them more, thanks to Marce Kaye. Lol! 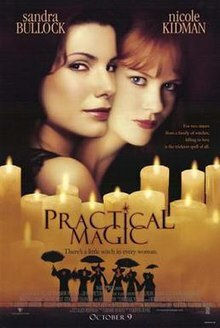 Anyway, here's a good movie that I would love to watch over and over again with my sissies: Practical Magic starring Sandra Bullock and Nicole Kidman. In this movie, they play the role of the Owen sisters and have nothing in common except for the fact that they are well, sisters and witches at that. And for two sisters from a family of witches, falling in love is the trickiest spell of all. Yes, this is the dilemma that these sisters are facing because they have been cursed, as well as any other Owen women before them. Any man who they fall in love with ends up dead. The good thing is that they found their happy ending, learned to accept that normal is relative and learned to embrace their "profession". How I wish I could watch this movie with my sissies again. Perhaps next year? Must purchase a DVD copy in case our plans to go home next year materializes. This movie always leaves me feeling warm and fuzzy so I am keeping my fingers crossed! ohh... i love this movie! of course, its a sandra bullock movie.